Vtech Vreader Game Cartridges Scooby Doo Dora The Explorer Lot of 11. Condition is Used. Shipped with USPS First Class Package. The games has been tested and works great. Happy bidding. Vtech V.Reader Dora the Explorer and the 3 Little Pigs. Pre-owned working condition - wear is consistent with regular use. See photos. Dora the explorer- Dora and the three little pigs. Pre-owned in mint condition. Disney--The princess and the frog. 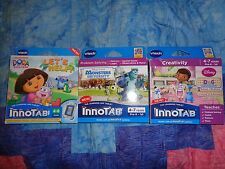 For InnoTab® systems except InnoTab® MAX. Disney Pixar BRAVE. Nickelodeon Dora the Explorer Let's HELP! 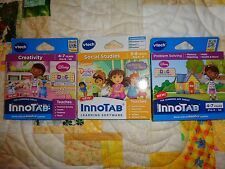 For sale is a Lot 3 NEW V tech V. Reader books Dora. Compatible with all VTech MobiGo systems. Vamonos - Let's Go! Dora the Explorer teaches colors, shapes, beginning letters and counting. 5-The Little Marmaid. 4-Elmo’s Big Discoveries.